Solution Saddles Customer Story - From the Archives. Coedeneirin Solo is a 12.3 hh Welsh Section C pony owned by Lindsay Caldwell. He is based at the late John Dufosee’s stables at Nyland in Dorset, and has recently been awarded the Pitchford Trophy by Endurance GB at their annual Awards Dinner in Daventry, for the registered native pony gaining the most points in all types of EGB rides for the 2010 season. Solo did not have the best start in life, he was ridden far too early and his back muscles were badly damaged. He was rescued in a poor condition and scared of his own shadow. He has been ridden by ex-British team member Lisa Franks, since 2006. ‘Solo’ was originally destined for the show ring, and although he had many successes, and did qualify for the NPS novice ridden championships at Malvern, he has found his real niche in Endurance. He has built up over the years and now regularly completes rides up to 80 km in a day and has represented Wales at the Home International Competitions for the last four years, most recently placed 5th in the 82 km endurance ride at Burgie, Scotland in August 2010. In 2007 Solo surpassed what his team had hoped for him, not only did he complete one 80 km ride to go advanced, but he completed the 80 km ER (race) at the Inter-Regional Championships, helping their team to second place overall. They then went on to be given an award at the Red Dragon as the top scoring Native Pony and best pony under 14hh. Lisa was thrilled to bits with Solo in 2008 as he was progressing well. As they looked forward to competing for the Welsh Team in the Home International in Northern Ireland, Lisa reported “After Solo successfully completed the FEI CEI 2* 80 km endurance ride at Euston Park, at a speed he has never done before in his life (13.99 kph! ), the vets were quite interested when we said we used a Solution saddle - there is not a mark on his back” At the end of the season, after successfully completing 10 rides, Solo was going beautifully and was full of life when he went ‘out on holiday’. 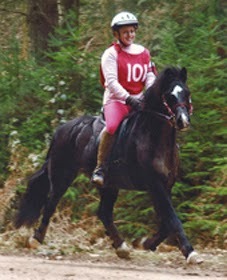 In 2009 Solo continued his success and was awarded the trophy for the best pony under 14.2hh ridden by an adult, sadly picked up an injury that cut his season short. 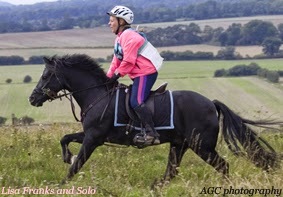 He bounced back in 2010 and Coedeneirin Solo and Lisa Franks added to their long list of achievements and awards, including a distance award for successfully completing 2,400 km in his career to date – all in his Solution saddle! He also has taken the regional native trophy for the past four years and the top under 14.2hh. Lisa and Solo have had a good start to 2011 having already completed over 300km competitively. So far they have achieved a top ten placing in an FEI 1* 80 km ride and a bronze award in the Exmoor 80 class at the Golden Horseshoe. They are starting out with their new SMART Native saddle and looking forward to another successful season.